With the probable lifting/softening of sanctions against Russia in 2017, there will be no sense or impetus for the Kremlin to implement the Minsk agreements. One could even say that Minsk-2 has six months at most, in fact. Therefore, Kyiv is looking for options of how to work in a new international situation. "... The question arises: what is the guarantee that all our optimistic plans do not stay on paper? The answer is obvious. 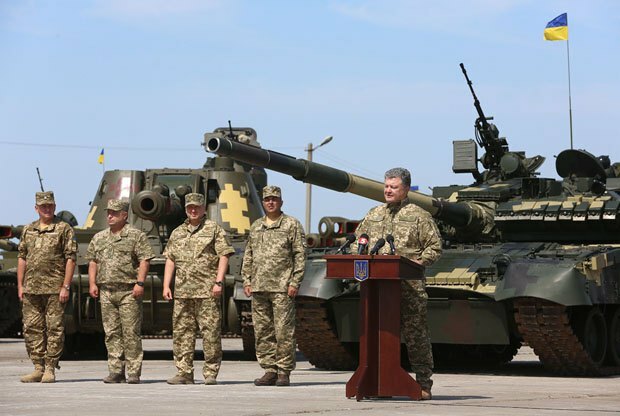 Our main guarantor is the Armed Forces of Ukraine. 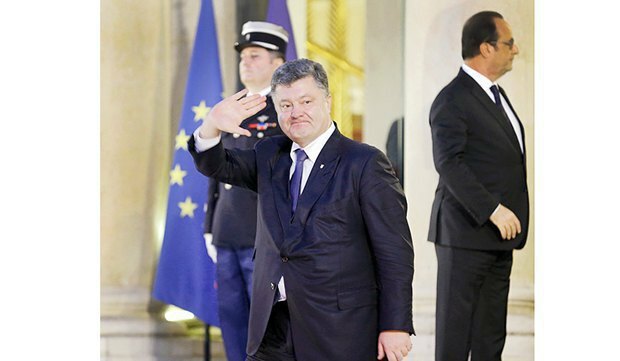 And this is far more serious than the Budapest memorandum, " Poroshenko said to the applause of the audience. Poroshenko was not trying to be witty when he mentioned the Budapest memorandum. LB.ua has every reason to believe that Poroshenko is preparing a major change in his approach to the foreign policy of Ukraine. 5. not to use nuclear weapons against any non-nuclear weapon state party to the Treaty on the Non-Proliferation of Nuclear Weapons, except in the case of an attack on themselves, their territories or dependent territories, their armed forces, or their allies, by such a state in association or alliance with a nuclear-weapon State. In addition, France and China, as members of the "nuclear club" and full-scale participants in the Treaty on the Non-Proliferation of Nuclear Weapons, instead of signing the memorandum issued relevant statements. The main difference between these statements and the memorandum is the absence of a clause on compulsory consultations in the event of disputes. Twenty-two years after the memorandum was signed, at the beginning of the Russian aggression, Ukraine had every right to expect the signatories of the Budapest memorandum - the United States and Great Britain - to honour their commitments. Alas, London and Washington only issued loud statements and later introduced the sanctions. This gives grounds to say that neither Russia which annexed Crimea and waged the war in Donbas nor the USA or the UK fulfilled their commitments under the Budapest memorandum. With this in mind, the Americans and British find a lot of diplomatic and legal tricks, to which they pick the appropriate wording. For example, US diplomats say off the record that they do not consider the Budapest memorandum to be legally binding on the United States, since while signing a multilateral treaty, from the point of view of international law, each country is ruled by its national legislation. Given that at the initial stage of Russia's military aggression against Ukraine, we were in desperate need of any form of international support, albeit only in words, Kyiv did not highlight a very regrettable fact of the non-implementation of the Budapest memorandum by the USA and the UK. However, today, in the context of the upcoming changes in the international agenda, these circumstances stand in a quality new context. "Did you notice my statement about the Budapest? I meant it," the president said at a closed meeting with ambassadors a few hours after the parade. Poroshenko did not go into details, but made it clear that he would like them to consider his statement as direct call to action. "We will now embed this in foreign policy by all means," a high-ranking source in the presidential administration told LB.ua. LB.ua sources, who attended the closed session, clarify: Poroshenko's remarks should be interpreted as Ukraine's preparations for changing the foreign policy context around our country and the Russian aggression. First of all, for the likely lifting (partial) of the EU sanctions against Russia, as well as a possible rise to power of more pro-Russian politicians in key countries of the continent. "Kyiv should be ready for this and not place too much hope on its international partners," a source in the diplomatic corps interpreted Petro Poroshenko's words this way. In addition, Poroshenko gave diplomats a lead by showing that international partners can and should be criticised, especially when they deserve this. First of all, it may concern the non-implementation of the aforementioned Budapest memorandum, delays in granting visa-free status and completing the ratification of the EU-Ukraine association agreement. It should be noted that not many significant international events, during which the Ukrainian issue will be considered, are scheduled for the next six months: the G20 summit in China in September will rather focus on economic issues and even if the Ukrainian issue is going to be raised, this will happen on the sidelines and indirectly; the EU summit in Bratislava on 16 September, which will consider the general concept of EU reform, has nothing to do with Ukraine; Russia sabotages meetings in the Normandy format while experts even suggest its "premature death"; the USA is busy with its own elections until November and a new president will not take office until January 2017. The most important things are not expected until 2017: a PACE session, the inauguration of a new US president. Also, the EU sanctions against (the financial, energy and defence sectors) of Russia are effective until 31 January 2017, and their fate is to be decided at the beginning of the year. All this time the Kremlin lobby, which has corrupted more than one hundred top European politicians (let us call a spade a spade - LB.ua), Moscow's aggressive information policy will work towards ensuring that the sanctions get lifted (or at least softened) and Russia returns to the club of the world's leading states. Although the EU's decision on sanctions is supposed to be based on Russia's implementation of the Minsk agreements - and, as can be seen in practice, there is a big problem, but the economic interests of EU countries will probably outweigh. No matter how much Angela Merkel said that she did not see the grounds for lifting the sanctions, it will be extremely difficult to maintain the European unity on this issue after January 2017. More and more countries speak in favour of resuming economic cooperation with Russia, even at the expense of democratic values, the declared principles and international law: whereas at first these were predominantly Spaniards, Italians Hungarians who said the sanctions should be lifted, now the club of "Russia's friends" is expanding. However, those who lobby for the cancellation of sanctions somehow forget to mention that their economies suffer not so much from European sanctions against Russia as from the countersanctions introduced by Moscow which banned foreign imports to Russia. And Russian President Vladimir Putin's decree extending Russian countersanctions until the end of December 2017. Therefore European leaders have to clearly understand that the issue of expedited access of European goods to the Russian market will be taken separately for each country. But for this, Europeans will have to go through a humiliating procedure of personal interviews with Putin in the Kremlin. Clearly, Ukraine (especially the most anxious part of Ukrainian society) will interpret the lifting of the sanctions against Russia as an absolute "betrayal", as evidence of the definite foreign policy "impotence" of the country's authorities. In fact, this development of events, according to the apt observation of a number of European experts, will attest, first of all, to the weakness of the European Union itself. Not able to stick to a consistent position and retreating under the pressure of the very Kremlin lobby. In addition, the possible lifting of the anti-Russian Western sanctions in 2017 is unlikely to improve the economic condition of the Russian Federation. A systemic economic crisis is raging in Russia, it will take from five to 10 years for the partial recovery of the economy, even under favourable conditions. 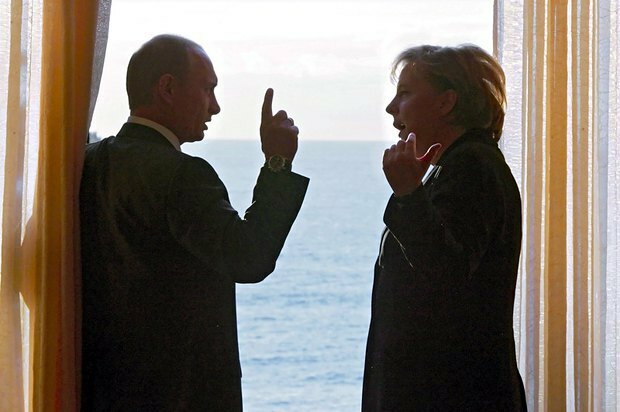 "I said a hundred times in the Russian media that we have a systemic economic crisis. No matter how much some Western and Ukrainian newsmakers would like to blame the crisis on the sanctions, it is not so. It's funny that this technique is being used by both some Ukrainian politicians and Russian propaganda in very active and very strange ways - both exaggerate the significance of the sanctions. Our troubles are not because of them, our troubles are a systemic economic crisis ," former Economics Minister Andrey Nechayev said in an interview with LB.ua. In his words, the slowdown and the consequent fall of main macroeconomic indicators began in 2012, long before Crimea, the worsened geopolitical situation and the drop in oil prices. The sanctions and the falling oil prices have exacerbated the situation, but were not the primary cause. Well, the lifting of sanctions is not going to raise oil prices on which Russia's welfare depends. Moreover, such an adjustment of the international foreign policy situation may significantly delay the issue of a Donbas settlement: with the lifting of sanctions against Russia in January 2017, there will be no sense or impetus for the Kremlin to implement the Minsk agreements. One could even say that Minsk-2 has six months at most, in fact. 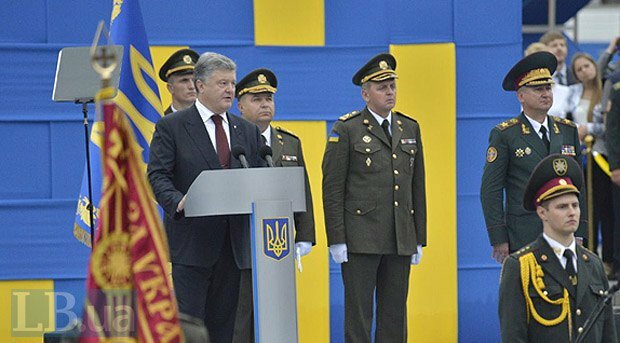 Thus it becomes clear why in his parade speech, Poroshenko matched the Ukrainian armed forces to international security guarantees. One should not think that Kiev will put up with foreign policy changes and give up. Quite the contrary. For example, Kiev is likely to respond with an initiative to convene consultations of the signatory countries of the Budapest memorandum (Article 6). Such an attempt was already made at the beginning of the Russian military aggression, but Moscow predictably refused back then. Most likely, it will refuse again. However, the other signatory countries will only be too glad that the Kremlin will bear responsibility for the failure of the agreements - after all, they are not too eager to fulfil the commitments which they undertook in 1994 either. In this situation, Kyiv faces no risks: a failure to hold consultations on the Budapest memorandum will once again demonstrate international helplessness. As the saying goes, "Repetition is the mother of learning", especially for Western partners. In a sense, Petro Poroshenko's remark on the Budapest memorandum resembles a well-known phrase by Russian Tsar Aleksandr III on two reliable allies of his empire - its own army and fleet. Well, a pragmatic foreign policy with a clear understanding that neither Berlin nor Washington, but only our own Armed Forces will be able to protect our country is what Ukraine has been missing in the recent years. The same is true for the ability to talk with our Western partners on an equal footing - without flattery and eternal Ukrainian crying "give us a little money." However, a tougher foreign policy requires systemic internal changes. And it is much more difficult than adjusting one's own diplomacy. Ukrainian envoy downplays anti-Russian sanctions' effect on German economy as "myth"